I have been snoozing through the Sestak scandal. So the White House offered Mr. Sestak a "high up" job if he dropped out of the primary race against Arlen Specter. another back room deal, so what? Being a successful small business person isn’t just about collecting a profit or outperforming your competition. It’s about contributing to the success of this country’s economy.Being a successful business owner is exactly about making a profit ... so you can grow, supply more and better goods and services to customers at a better price, and generally help the economy and provide employment. MSNBC fraudulent? Who knew? Well, I did here, The Incredibly Dishonest MSNBC. I've noticed a few recent news articles are reporting Rand had the following exchange with Rachel Maddow. Maddow: Do you think that a private business has the right to say, "We don't serve black people"? Moron of the Day: Sandra Soto Ph.D. Above is a picture of a douche-bag professor intent on warping the minds of impressionalbe children. She used a commencement speech at Arizona University to make an ill considered political speech. Agree with her or not, she usesd exceedingly poor judgment to ruin a perfectly good commencement. It will come as no surprise that she specializes in identity studies, e.g., gender studies, chicano studies, queer theory, etc. It is good to see that Arizona University did not turn its student body into a bunch of mushheads. Famously, US Attorney General Eric Holder and Homeland Security Chief Janet Napolitano oppose Arizona'a immigration law, but admit they have not read it. Well, here it is! Read the bill, before actually having an opinion on it. Glenn Beck now has his weinerfacts web site responding to the ridiculous attacks by congressman Anthony Weiner. We have previously reported on Mr. Weiner's whining. If you want to know what kind of guy Mr. Weiner is, you can see for yourself here. Mr. Weiner demonstrates himself to be a total doofus. Congratulations to him. Moron of the Day: Chicago Mayor Richard Daley Jr.
How effective can Chicago's gun ban be if it fails to keep guns out of the hands of its nut-job mayor? Mayor Daley demonstrates that reporters need guns to protect themselves from ... Mayor Daley. Life Created in the Lab? Scientists in the US have succeeded in developing the first synthetic living cell. The advance, published in Science, has been hailed as a scientific landmark, but critics say there are dangers posed by synthetic organisms.I think we already have too many synthetic organisms and they are primarily in Congress. This is another questioner from the Horowitz speech at UCSD, but funnier. Listen, if you can get past the hideous valley-girl accent of the questioner. Unfortunately for the questioner, even if the question were good, he manner of speaking detracts tremendously. If the lefties think Sarah Palin's accent makes her sound like a hick, this student's accent makes her sound like an air-head. Like But, the, like, question wasn't, like, all that good, like, either. Likey-like. In case you were wondering about the mass teacher firings I reorted on here and here, the union gave in and the teachers have been rehired. It just takes the guts to go forward, I guess. More on the story plus video here. This is unbelievable. That three stooges spooked Iraq out of tying up its oilfields to produce oil through an American company, Exxon Mobil. Instead the Iraqis inked a 20 year exclusive deal with China. It’s the classic American political tale of self-loathing crafted by the usual suspects. With its government firm and its security at its post-surge best, the Iraqi government needed to quickly bring its oilfields online. It desperately needed the revenues. The summer of 2008 saw oil prices above $100 per barrel and Americans were paying $4 per gallon at the pump. The best in the business – the best in the world – is Exxon-Mobil. And the government of Iraq turned to America’s Exxon-Mobil to bring undeveloped and underdeveloped fields online to rejuvenate its own revenue sources and ween itself and its people off of American aid. This needs no explanation. Enjoy. Campell Brown, the liberal news anchor on the 8 p.m. time slot of CNN, is out. Her ratings were invisible compared to competitors Bill O'Reilly, crazy Keith Olbermann, and Nancy "True Hyped-up Crime" Grace. Why? Ratings. As she put it in her resignation letter, "not enough people want to watch my program...." About right. When we get more news from another network's opinion shows -- like O'Reilly's -- you know that a network is in trouble. Free Market Principles Arise in U.K. It was a cheeky and unexpected sight that greeted commuters as they boarded a Tube into work. But the four naked men and women certainly livened up the usually dull journey for many people – attracting gasps from stunned workers. Carrying handbags or briefcases to cover their modesty – and wearing shoes – the nudes travelled on escalators and rode in the carriages as though their lack of suitable attire was completely normal. But, rather than trying to start a new trend on the London Underground, the group were promoting a TV series which sees staff at struggling businesses helping to turn their company around. When it comes to the Cato Institute, I agree with far more than I disagree. when I heard Julian Sanchez on the Cato podcast discussing his theory of "Epistemic Closure," I was shocked by some of the things that he said and I need to set him straight. Mr. Sanchez coined the words epistemic closure to describe the effect of a closed circle of information. When one gets one's information about the world from all the same sources, who all agree with each other, and who cite each other as sources, one necessarily ends up with false beliefs endemic to that circle of information. For example, a conservative may get information from Hannity, Malkin, the Washington Times, and National Review. This closed circle of media cites each other and even if a story is false, it gains traction from each source citing the other. The basis for her asylum request hadn't been made public. People who seek asylum must show that they face persecution in their homeland on the basis of religion, race, nationality, political opinion or membership in a social group. At first blush this l looks like a who-you-know decisions, but I am not so sure. There may be a Barack Obama connection, but not the one that is obvious. If I were arguing her case, I would suggest that deporting her threatens national security, because it makes her vulnerable to kidnapping and subsequent blackmail of the president over the safety of his aunt. I would not make a big deal about this decision on favoritism grounds. I am not emotionally a Republican, although I vote in the Republican primaries around home. But the Republican party is the best chance of fighting the Obmanation slide toward more and more government. However, I boldly propose a plan for the Republicans in Congress. They are outnumbered, but not out-gunned, thanks to the filibuster threat in the Senate. The Republicans can and should act unanimously to block the Kagan Supreme Court nomination. They should do so for many reasons, including big-picture tactics. 1. Elena Kagan does not have a Supreme Court caliber mind or and is not a Supreme Court caliber person. Her writing is uninspired and uninspiring. Her work as Solicitor General before the court was lackluster, at best. 2. Her writings show a decided socialist bent. She may or may not be the best anyone can expect from an Obama appointee (at least she is not a Maoist or self-avowed Communist), but she is still far, far from acceptable. I probably don't agree with all of his political positions, but this is a great ad. This is a clip of Muslims trying desperately to prove that they are not fit for civilized society, certainly not any civilized society which values free speech. They succeed in that proof. There are times for interfaith dialogue, for mutual respect and compassion. This isn’t one of them. Shahzad’s car bomb was parked in front of the offices of Viacom, the parent company of the Comedy Central, which airs the program South Park. Last month, the creators of South Park decided to poke fun at the Prophet Muhammad—just as they’d poked fun at Moses and Jesus many times in the past. Death threats followed. It’s too early to connect the Times Square bomb plot to the South Park blasphemy, but police have not ruled it out. Eric Holder Won't Say "Radical Islam"
While it is always fun to watch a liberal sqirm, this clip is, to me, quite frightening. It is obvious that Mr. Holder wants to put his head firmly in the sand (or elsewhere that the sun does not reach) to assure political correctness. Memo to Mr. Holder: Radical Islam is behind nearly all if not all terrorist bombings and attempted bombings in the United states in the last 10 years. How can you solve a problem that you are afraid to name? With the exponential growth of entitlement programs, I have come into contact with the recipients of government aid, welfare, disability, Medicaid, more and more frequently. The most consistent thing I have noticed is that in most, but not all cases, the person needed some sort of assistance and in nearly all cases, the recipients has assisted themselves by cheating on the rules in some way. Sometimes it is cash work "under the table." Sometimes it is phony rent receipts. Sometimes the rules discourage marriage by couples living together, because one partner would lose the benefits of the public dole. Sometimes it is lackadaisical efforts to find a job before unemployment runs out. Usually these folks are not all that shy about their falsifications. Fraud is so common. Continuing on a theme, Congress cannot repeal or amend the laws of economics any more than it can repeal or amend the law of gravity. The war on drugs is akin to an attempt to amend the laws of economics. As long as there is a demand for mind altering drugs, there will be suppliers. The war on drugs makes it risker and more difficult (but obviously not impossible) for suppliers to supply the drugs. The war attack the supply. The laws of economics kick in. Where there is a demand, but supply is limited, prices go up. As long as prices exceed costs to the supplier, the supplier can make a profit. Where there is a profit to be made, folks will fill the breach and make it. But what are the other effects of the higher prices? With an addictive substance, demand is far less responsive to prices. The addicted will pay whatever the cost. How? How will the addicted get the money? This is a lesson that goofy liberals (uh, I mean, progressives) never learn. The laws of economics are like the law of gravity. They cannot be repealed. They cannot be amended. The Detroit News is reporting, surprise, surprise, that landscaping workers would rather keep their unemployment than return to work. Refusal to work is the economic incentive created by the extended unemployment benefits enacted by Congress. Only a moron -- or a "progrsesive" -- would think the world would work otherwise. At first blush, Elena Kagan is at best an unimpressive nominee for justice of the United States Supreme Court. She has no track record as a judge and there are plenty of abysmal things in the record that she does have. For starters, I would not trust any nominee by this president. He has surrounded himself with self-avowed Communists and Maoists. He is a seriously flawed man who thinks himself to be the transformer of America. Think cartoon. Elena Kagan has many faults as a nominee. She reportedly kicked military recruiters off the Harvard Campus. According to Glenn Beck, she said in the Solicitor General confirmation hearings that people who are "suspected" for contributing financially to terrorist groups should be held without bail or trial. She is accused of coddling leftist plagiarists at Harvard. She has written that the right to free speech should be balanced against "social costs." Due to the "too many things to do" syndrome, this blog is taking a vacation (not me, the blog). Check back from time to time, please. Himself making false slurs about tea partiers supposedly making racial comments, Rep. Andre Carson called the tea parties "one of the largest threats to our internal security." 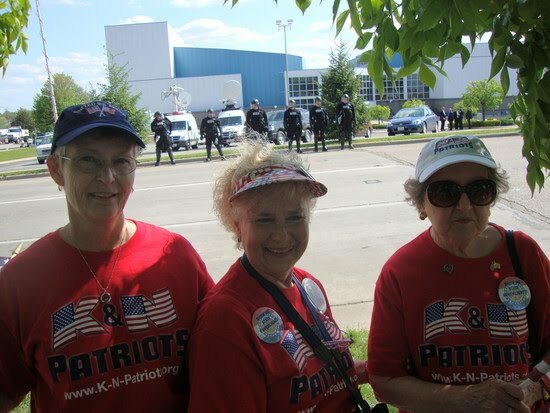 Does any sane person consider these ladies as a threat to internal security? Maybe Rep Carson misssed David Letterman's interview which I blogged about here. Do you know what the real threat to internal security is? Morons like Carson getting elected to Congress. The shooting happened April 26, 2010. The police ticket Mr. McCullough on suspicion of carrying a concealed weapon, but ultimately, McCullough was not charged. The police confiscated his handgun and have refused to allow him to register the replacement gun purchased from donations given to him by the Nebraska Firearms Owners Association. Story here. The demagogues of the Democratic Party like to howl about how lowering capital gains taxes favor "the rich." No. Lowering capital gains taxes favors job creation and the economy overall. Does anyone besides me find this Pennsylvania government ad creepy? He has many times been a finalist for his foolish and illegal anti-gun activities, but New York Mayor Michael Bloomberg finally wins the award for his speculation on the New York car bomber last weekend: "If I had to guess -- 25 cents -- this would be exactly that, somebody ... home-grown, maybe a mentally deranged person or somebody with a political agenda that doesn't like the health care bill or something." Bloomberg is thinking tea partier, no doubt. Their rallies have been so violent! Instead, the "suspect" was Pakistan-born, naturalized American citizen, a follower of the Religion of Peace. What? A Muslim? Really? Who saw that coming?